The ability to generate and manipulate arbitrary quantum states of a particular system is necessary in order to use this system in quantum information technology. Scientists have developed this ability for a variety of physical settings, for example, ion traps  or superconducting cavities coupled to a Josephson qubit . However, independently from the way future quantum computers may perform their own calculations, they will have to communicate among each other. There must be a communication medium able to carry quantum information over long distances without too much losses or decoherence. The only medium that satisfies this requirement is light. The Quantum Information Technology Group at University of Calgary. Other authors of the 'Nature Photonics' paper  : Alexander Lvovsky (Leftmost) Andrew MacRae (4th from Left)and Nitin Jain (7th from Left). The problem is that preparing arbitrary quantum states of photons is notoriously difficult because photons can not stand still while information is being encoded on them. Moreover, they are easily destroyed by any instrument they encounter. So far, for these reasons, only small islands have been explored in the vast ocean of quantum states of travelling light fields. Examples of quantum optical states prepared and analyzed to date include single- and two-photon states [3,4], superpositions of vacuum and single photon  and “Schrödinger kittens” . To continue the naval allegory, exploring an ocean requires a map. In our case, the map is provided by photon number states, or Fock states. These states form a basis in the optical Hilbert space: any quantum state of light, however complex, can be written as a superposition of photon number states. If we could find a way of constructing arbitrary Fock state superpositions, we would have resolved our challenge. Unfortunately, such a vision is beyond practical reach, because there is an infinite number of Fock states and their energy is unlimited. It is possible, however, to approach this ideal with small steps. What we accomplished, and reported in a recent paper in Nature Photonics, is extending the accessible part of the optical Hilbert space to the subspace spanned by the first three basis elements. In other words, we engineered and characterized arbitrary superpositions of 0-photon, 1-photon and 2-photon states. In order to tailor the quantum state of a travelling light pulse without annihilating it, we made use of one of the most basic yet mysterious quantum phenomena: entanglement. 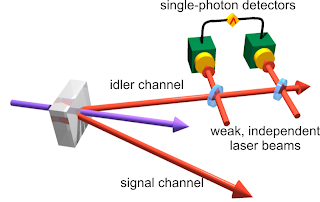 We focused blue laser pulses into a nonlinear crystal that can convert a blue photon into an entangled pair of lower energy red photons going along two different paths or “channels”. Then we performed measurements on one of these channels (idler), which prepared the wanted state in the other channel (signal). Such remote state preparation is possible because of the entanglement between the channels: the two of them form a single system described by a global quantum state, so an interaction with one particle will affect the other, even though the two channels can be spatially separated. 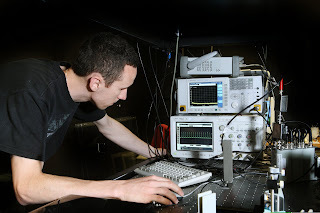 To perform the measurement in the trigger channel, we mix, on beam splitters (half-silvered mirrors), the photons emerging from the crystal with those coming through two weak independent laser beams. Two of the beam splitter outputs are directed to ultra-sensitive single photon detectors, and we look for events where both these detectors “clicked” at the same time. We align our optics in such a way that it is impossible to determine whether the photons that trigger the detectors come from the crystal or the independent beams. Accordingly, a coincidence “click” indicates that the number of photons coming to detectors from the crystal could have been 0, 1 or 2. Because the photons in the crystal are always born in pairs, the signal channel will also contain 0, 1, or 2 photons. A more thorough calculation involving the entangled nature of the optical state produced by the crystal shows that this alternative – 0, 1, or 2 photons in the signal channel – is not simply a probabilistic mixture, but a coherent superposition of these Fock states. By varying the amplitudes and phases of the two independent beams, we can change the probability amplitudes of the three components in the superposition. For example, if we set both amplitudes to zero, the “clicks” can occur only due to the photons from the crystal, and the state of the signal will be a pure two-photon state. If, on the other hand, we make the intensity of the independent beams high, they are likely to generate most of the “clicks”, so the signal will with high probability not contain any photons. In order to verify that the signal state is what we expect it to be, we measured a large number of samples of this state and analyzed it using a technique known as optical homodyne tomography . This technique allowed us to determine the signal states and compare them with theoretical predictions. By repeating the measurements for several different settings, we were able to show that arbitrary preparation of states within the set studied is indeed achievable for a travelling pulse of light, without destroying it or having to store it. To summarize, this work enabled us to reach a whole new region of the optical Hilbert space and study the properties of new quantum states of light, at the same time unifying in a single experiment many previously investigated states. More practically, the kind of states produced during this experiment has immediate applications, for example, optimal estimation of the loss parameter in a gaussian bosonic channel . A. Ben-Kish, B. DeMarco, V. Meyer, M. Rowe, J. Britton, W. M. Itano, B. M. Jelenković, C. Langer, D. Leibfried, T. Rosenband, and D. J. Wineland, "Experimental Demonstration of a Technique to Generate Arbitrary Quantum Superposition States of a Harmonically Bound Spin-1/2 Particle", Phys. Rev. Lett, 90, 037902 (2003). Abstract. Max Hofheinz, H. Wang, M. Ansmann, Radoslaw C. Bialczak, Erik Lucero, M. Neeley, A. D. O'Connell, D. Sank, J. Wenner, John M. Martinis & A. N. Cleland, "Synthesizing arbitrary quantum states in a superconducting resonator", Nature, 459, 546 (2009). Abstract. A. I. Lvovsky, H. Hansen, T. Aichele, O. Benson, J. Mlynek, and S. Schiller, "Quantum State Reconstruction of the Single-Photon Fock State", Phys. Rev. Lett. 87, 050402 (2001). Abstract. A. Ourjoumtsev, R. Tualle-Brouri and P. Grangier, "Quantum Homodyne Tomography of a Two-Photon Fock State", Phys. Rev. Lett. 96, 213601 (2006). Abstract. A. I. Lvovsky and J. Mlynek, "Quantum-Optical Catalysis: Generating Nonclassical States of Light by Means of Linear Optics", Phys. Rev. Lett. 88, 250401 (2002). Abstract. Alexei Ourjoumtsev, Rosa Tualle-Brouri, Julien Laurat, Philippe Grangier, "Generating Optical Schrödinger Kittens for Quantum Information Processing", Science 312, 83-86 (2006). Abstract. Erwan Bimbard, Nitin Jain, Andrew MacRae, A. I. Lvovsky, "Quantum-optical state engineering up to the two-photon level", Nature Photonics, Published online: 14 February 2010 doi:10.1038/nphoton.2010.6. Abstract. A.I. Lvovsky and M.G. Raymer, "Continuous-variable optical quantum-state tomography", Rev. Mod. Phys. 81, 299 - 332 (2009). Abstract. G. Adesso, F. Dell'Anno, S. De Siena, F. Illuminati, and L. A. M. Souza, "Optimal estimation of losses at the ultimate quantum limit with non-Gaussian states", Phys. Rev. A 79, 040305(R) (2009). Abstract.